Ausbert d’Auvergne was educated at the Castries Anglican Primary School, St. Mary’s College and the St. Lucia A-Level College. Minister d’Auvergne is an Island Scholar. He is the holder of Master of Arts in Economic and Social Studies (Development Studies), and Bachelor of Arts (Honours) in Economic and Social Studies (Economics and Agricultural Economics) Degrees from the University of Manchester, United Kingdom. 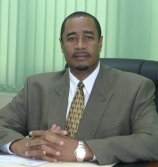 He is a former Permanent Secretary in the Ministry of Planning, Development, Housing, Personnel Establishment and Training who reported directly to Sir John Compton, the Prime Minister. In that capacity he represented the Government of St. Lucia extensively throughout the Caribbean Region, North America, Latin America, Europe and Asia, participating in numerous meetings, negotiations and conferences in the areas of development finance, development planning, development administration, development policy, project development and financing, environmental management, energy policy, science and technology development, land reform, land management, Caribbean economic integration, Caribbean political integration, public administration, public sector reform, management for change, public service reclassification, human resource development, legislative reform and administrative reform. After leaving the Public Service in 1994 Minister d’Auvergne worked as an international consultant and undertook numerous consultancy assignments throughout the world in his various areas of expertise. On February 22, 2004 together with others, Ausbert d’Auvergne founded the National Development Movement (NDM), a new political party, and became its Political Leader. When the National Development Movement decided not to contest the 2007 General Elections, Minister d’Auvergne, at the request of Sir John Compton and with the approval of the Executive of the NDM, agreed to manage the final phase of the election campaign of the United Workers Party. Minister d’Auvergne is the holder of a 3rd Degree Black Belt in Karate and is a founder and a former Administrator of the St. Lucia Martial Arts Commission. He maintains an avid interest in reading on development issues, music, international affairs and international politics.